We may never get to see Tiger Woods strutting his stuff on the Gold Coast, but the city has secured the next best thing in terms of golfing royalty -- his niece Cheyenne. Having the Woods name will always mean that Cheyenne will have opportunities other golfers at her level don't have; that she'll receive more attention than she (probably) deserves. But that cuts both way - she'll receive more criticism and scrutiny than she deserves, too. It's not her "fault" that she is Tiger Woods' niece, and she'd be foolish not to take advantage of all the opportunities having that name presents. If there's one thing we can say about Cheyenne already, its that she's no fool. She is a smart, poised, classy young woman. And she's talented at golf. Right now, her playing level is probably somewhere around that of a good but not great player on the Futures Tour. But those golfers sometimes turn into stars on the LPGA Tour, and Cheyenne might have the drive and work ethic to reach that level, too. Time will tell. A Golf Swing Worse Than Charles Barkley's? Somewhere, Charles Barkley is saying, "thank you, Tyreke!" I'm suspicious. How can someone so athletic look so pathetic? Is this just a put-on? Surely he - or anyone - could do better than that. Right? Yes? No? For another contender for "worst celebrity golf swing," see our previous post, Yao Ming Can't Play Golf. 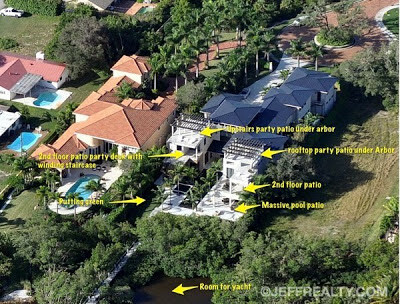 Here are some more photos of Rory McIlroy's new house, which he recently purchased for $9.5 million in Palm Beach Gardens, Fla. 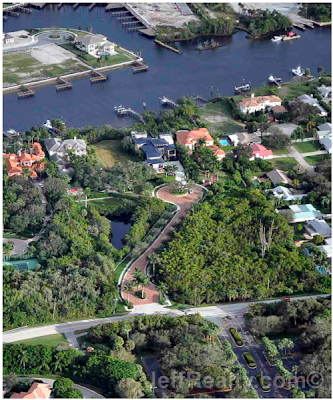 The house is in a small, gated community named Old Gate, and it backs up to the Intracoastal Waterway. Presumably, Rory - and his love, Caroline Wozniacki - will have a nice, big boat of some sort, probably a yacht, sitting soon in the water out back. Rory's house, by the way, is the one with the dark gray roof; the sort of rusty tan-colored roof next door is the neighbor's house. 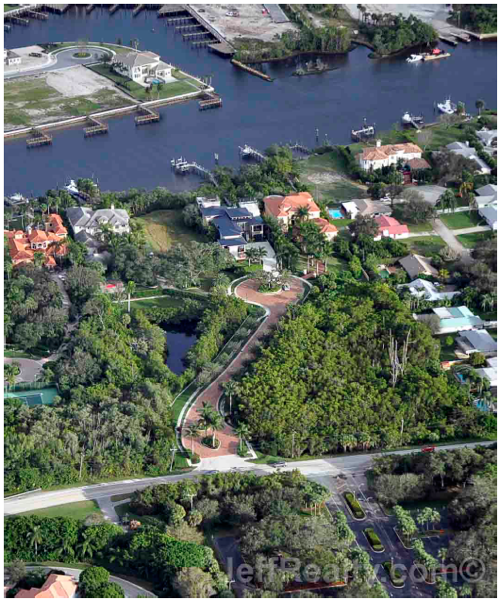 On the other side of Rory's new Florida house is, currently, an empty lot. If I was Rory, I'd buy that empty lot myself to prevent anyone moving in next door. Because, looking at these photos makes it clear: This home doesn't really come with much in the way of seclusion or privacy. Privacy from riff-raff like you and me, sure; privacy from rich riff-raff? Not so much. I'm sure the home is absolutely lovely indoors; it has six bedrooms and nine bathrooms. It's less than a mile from The Bear's Club. It has "a center glass core and window views everywhere throughout the house. It's really an updated Frank Lloyd Wright turned modern. Multiple party patios on multiple levels and on opposite sides ... a putting green is already in place." ... I'm really not that impressed, either. 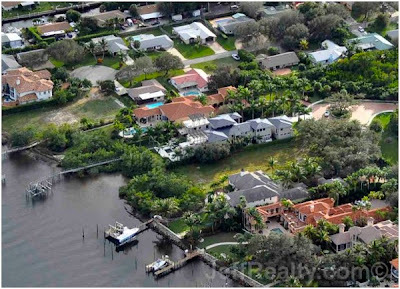 Look at all those houses crammed together, all those people crammed together. Rory really doesn't even have his own private driveway. That roundabout that is directly in front of Rory's home? It's actually the entryway for four different houses, including Rory's. Or maybe my tastes or just more hifalutin' that Rory McIlroy's tastes! Probably a good thing that I don't have enough money to live "up" to my tastes. 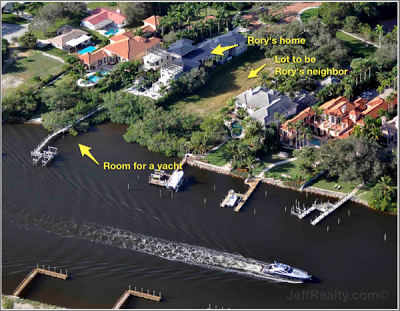 Photo Credits: Jeff Lichtenstein specializes in marketing real estate from Juno Beach oceanfront condos to http://www.jeffrealty.com/boca-raton. His Father, Cary Lichtenstein, a resident of Admirals Cove, has rated golf courses for GolfWeek magazine and has played all Top-100 courses in the US. He enjoys helping high net-worth buyers and sellers with their real estate needs. Update: Watch a video showing the interior of Rory's house. It's gorgeous on the inside. Lesson learned: Don't just a house by its roof. Get that mother******* visor off your mother******* head! 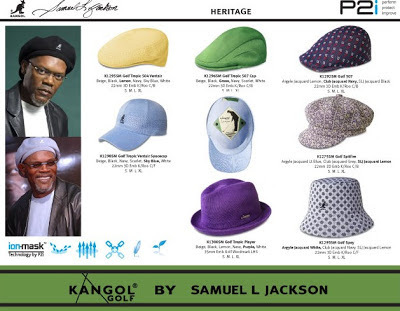 "While the Kangol Golf by Samuel L. Jackson collection offers nods to Kangol's history, it also incorporates ultra-modern performance treatments. The refined Heritage styles feature P2i's revolutionary, liquid-repellent ion-mask technology, which provides an undetectable coating, causing liquids to bead up and roll off the hats. "The range of hats incorporates Samuel L. Jackson's personal touches through use of his favorite colors, purple and yellow. The SLJ Jacquard print on the P2i Golf Spitfire was inspired by a vintage hat from Samuel's personal Kangol hat collection to create his own unique print. 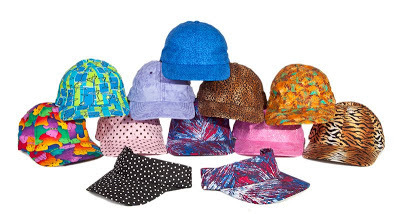 All hats in the range contain an interior 'Kangol Golf by Samuel L. Jackson' woven label." You ever notice how most golf company press release sound the same? You know who doesn't sound like everyone else? Samuel L. Jackson, mother******! Like that time, in that movie, he said, "Blessed is he who, in the name of charity and good will, shepherds the golfers through the Valley of Sin. For he is truly his brother's keeper and the finder of lost golf balls." Or "I'll just walk the earth. ... meet people... get into adventures. Like John Daly searching for a lost ball." Or "You refer to the prophecy of The One, who will bring balance to the Force. You believe it's Rory McIlroy?" You know what else I'm partial to? Kangols! Because if they're good enough for Samuel L. Jackson, they're good enough for me. But whether you love Kangol caps or not, just remember ... Get that mother******* visor off your mother******* head! 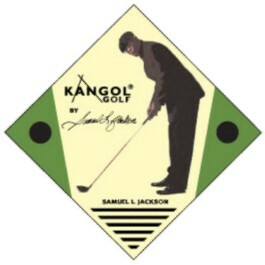 See the Kangol website for more. But I do have a point to this post, beyond the gratuitous Paula bikini pic (although that really is enough to justify a post!). We really need to campaign for Paula to be in the Sports Illustrated swimsuit edition. Is there any doubt that Creamer is one of the hottest female athletes on the planet? No. The answer is no. There is no doubt. And, good news: Paula has already said she would consider it if asked. I recall her responding to a question from one of her Twitter followers about it, with something along the lines of, "Yes, of course I'd consider it." So here's what we need to do. MJ Day is the editor of the SI swimsuit issue. She's on Twitter at MJ_Day. So if you are on Twitter, send MJ a polite request to put Paula Creamer in the swimsuit issue. More Paula Creamer bikini pics: This is where we started archiving bikini pics that Paula shares on social media. You'll find many more here. There's nothing secretive, of course, about the need for many golf courses in places with warm summers by cool winters to overseed during winter months, in order to switch to a winter grass as their bermudagrass goes dormant. (If you don't understand why overseeding takes place, here's a good primer from the Golf Course Superintendents Association of America). What I don't understand is why some golf courses are so secretive about their overseeding schedules. You know the ones: you call for a tee time, they don't say, "hey, we just overseeded"; you show up and pay, they don't say, "hey, we just overseeded"; you reach the first green before you realize, "hey, they just overseeded!" I got an email recently from a local course that I play often, announcing that they have completed their overseeding and, boy, are the greens in great shape! Funny, I don't recall getting an email from them before they started overseeding, saying, "Hey, we're starting our overseed ..."
Golf courses would generate a lot of goodwill with their customers, especially regulars, if they were open about their overseeding schedule, announced it to everyone who called for a tee time, and offered a discount during the overseed period. Many golf courses already do that, and massive kudos to them. But many more don't. A few years back, I helped a Texas newspaper compile a chart listing the specific overseeding periods (start dates) of area courses. I called about 40 courses to get the info. Many of them were up-front and quick to reply. Some refused to say anything. Others wouldn't talk until they'd found out if their competitors had admitted to anything. 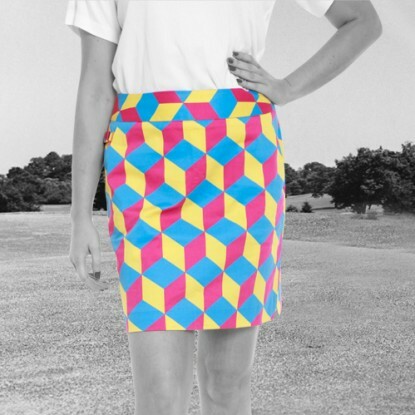 Loudmouth Golf Apparel burst on the scene back around 2004, 2005, with its wild, wacky, eye-hurting, vision-blurring golf apparel. 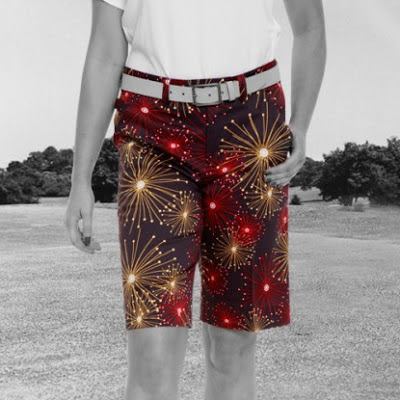 Golfers had spent decades trying to overcome the lingering stigma caused by those horrible 1970s golf fashions, and here was a company making clothes even uglier than those 1970s duds. That was the joke, of course. 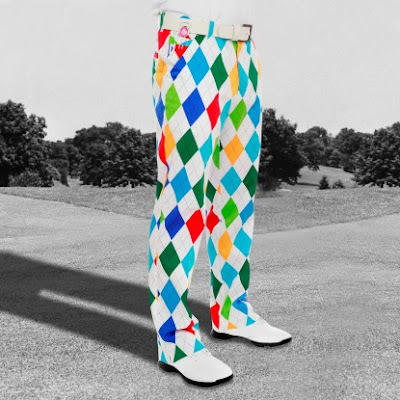 And a funny thing happened: Loudmouth caught on and grew, eventually signed John Daly and other tour pros, started showing up on the pro tours, and became kinda cool. See royalandawesome.com for more. Royal & Awesome makes men's and women's bottoms, plus flat caps and belts. Hey, Bode Miller, you could put an eye out with that thing! Bode Miller is the onetime American Olympic skiing champ, still a skiing icon in the U.S. His wife is Morgan Miller (formerly Morgan Beck), a professional volleyball player and model. I played my first round of golf lefthanded yesterday.It was pretty amazing.Los of terrible shots for my wife to laugh at. First major golfing catastrophy. :-( details soon,hospital now. Hospital? Oh, no! What happened? Yikes! "Worst feeling ever." Yeah, well, imagine how your wife feels! Double yikes! Triple yikes, if you click on that Instagram link in Morgan's tweet and view the damage to her eye. We do not recommend you do that, because it is truly disgusting. Morgan is very, very lucky that, in fact, she did not lose the eye. This accident could have been catastrophic, and I've taken the lighthearted approach above only because her eye appears safe. But you know the moral of the story: Whether you are the one playing a stroke, or the one watching a stroke, if you are on a golf course be very damn careful that nobody is in position to be hurt when you are hitting the ball! 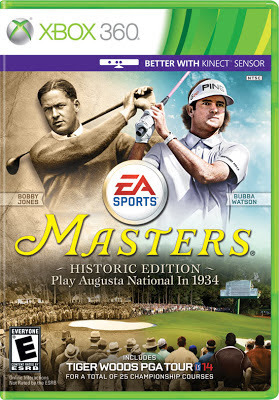 The PGA Tour, a few days ago, released the first six tournaments of its 2013-14 season schedule. One of those tournaments is the Shriners Hospitals for Children Open, the tour's Las Vegas stop. Notice anything missing? Right: Justin Timberlake! For the past four years, since 2008, the tournament was called the Justin Timberlake Shriners Hospitals for Children Open. Timberlake was called the tournament host, he put on a charity concert during the week, played in the pro-am, made appearances during the broadcast, was a public and visible figure promoting the tournament. Now, no JT. OK, OK, you got me: This is actually old news. Way back in October it was announced that Timberlake wasn't returning. His contract expired - he signed a 4-year deal to put his name on the event, that deal expired after the 2012 tournament, and that deal wasn't renewed. I apparently had my head buried in a sand trap during October and missed this. But now that I know, the question is, why? Why dump Timberlake (assuming it was the tournament's choice, rather than the celeb's choice)? No question he brought a lot of attention to a tournament that otherwise probably would have gotten much less. That had to be good for the Shriners folks. No doubt his concert raised money for Shriners. What gives? Back in October, the Las Vegas newspaper ran an article with some revealing comments from the tournament director. "... it seemed that when the TV cameras weren't on, (Timberlake) disappeared." Ouch! That probably explains everything: The Shriners people were ponying up a lot of sponsorship dollars to get Timberlake's involvement. And while JT was a very visible presence, when he wasn't visible - e.g., when the cameras were off - he was invisible. Gotcha. The Shriners folks wanted more from Timberlake than he was willing to give. While Timberlake did fulfill his obligations to the tournament and helped raise several million dollars through a Saturday concert his first four years, the fact is the pop star and original member of N'Sync wasn't able to generate greater interest in the tournament, and his star power wasn't enough to lure bigger-name players to the event on a consistent basis. "We're a world-class organization," Frevel said. "At the time we got involved with golf, we were told by the Tour we needed a big name, and that's how our relationship with Justin came about. "Justin's a wonderful person. But we tried everything we could to get him more involved with our kids and the hospitals. But it seemed that when the TV cameras weren't on, he disappeared." Sperling said despite the perception that Timberlake didn't do more to help grow the tournament, he believes Timberlake's presence did stabilize the event and allow it to take the next logical step. "The future of pro golf here in Las Vegas wasn't very secure when Justin and the Shriners came in five years ago," Sperling said. "Justin added a level of cache and star power in a city that understands the value of that." When Does Arnie + Jack + Fuzzy = John Daly? What's the answer to the riddle posed in the headline? This: When we're talking about the John Daly drink! Get it? 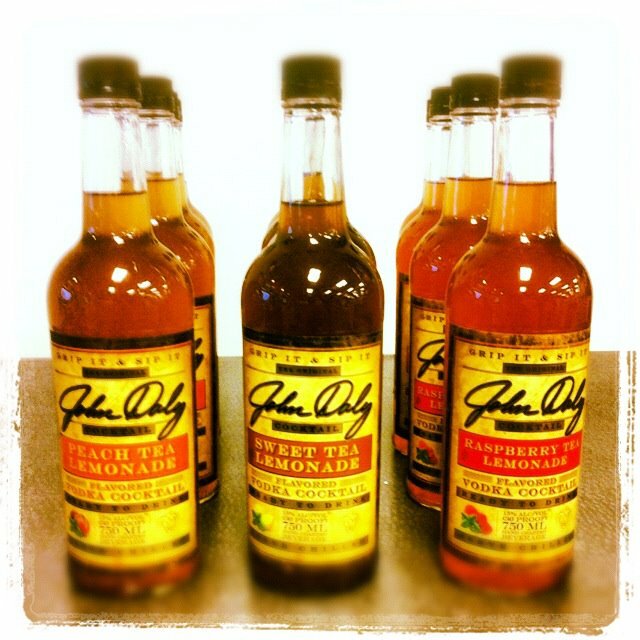 A John Daly cocktail combines tea and lemonade with vodka. Arizona Iced Teas markets the Arnold Palmer drink (iced tea/lemonade blend) and also markets Jack Nicklaus Lemonades. And Fuzzy Zoeller has his own vodka label, Fuzzy Vodka. 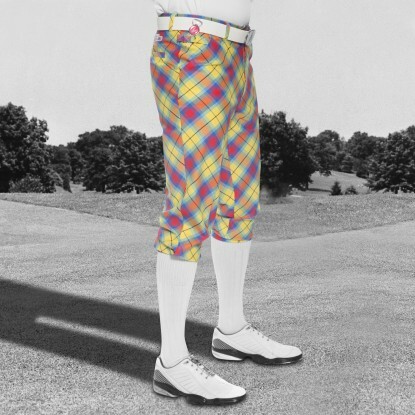 So: Arnold + Jack + Fuzzy = John Daly! Hmm, what's that, you say? If the Arnold Palmer already combines tea and lemonade, then won't adding Jack Nicklaus lemonades throw off the recipe? Um ... shut up! Math was never my strong suit. 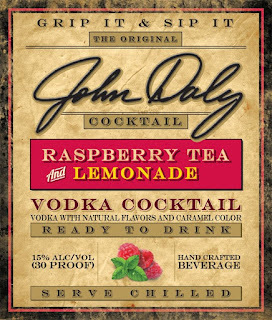 Anyway: Yes, John Daly (the golfer) is now marketing John Dalys (the drink). Long John put together a company that is making Original John Daly Cocktails, which are bottled vodka cocktails (30 proof). There are three of them to start with, each combining lemonade and vodka with, respectively, raspberry tea, peach tea or sweet tea. 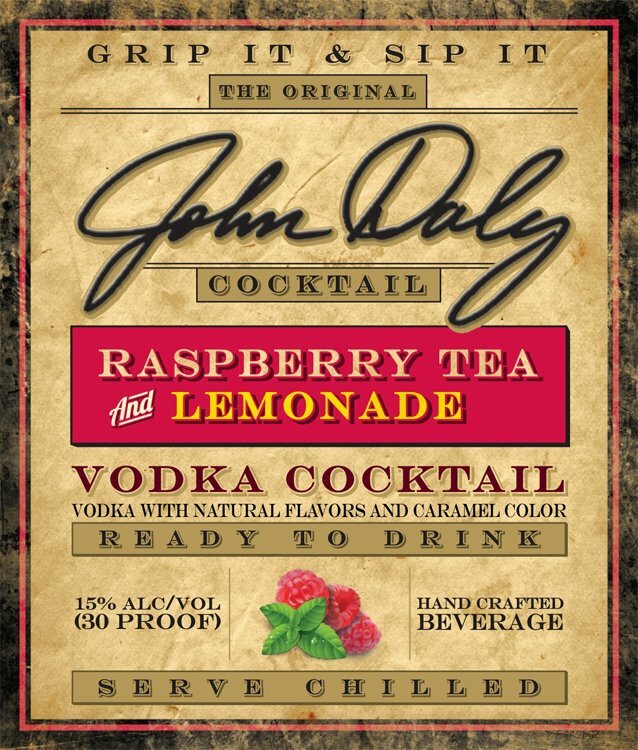 Daly's been talking about John Daly cocktails on Twitter for a couple years now, going back to 2010, when he ranted about bars and restaurants ripping him off by using the "John Daly" name. So Daly started up a company to make money off the cocktail that was already making money off his name. Good idea! The photos here are from the company's Facebook page. Where can you find these bottled drinks? Not too many places right now. Daly says they are first showing up in Bevmo liquor stores in California, Nevada and Arizona, expanding (hopefully) to other areas later. If you find them for sale, let us know what you think. In recent years, when something weird or wild happens during golf's swing through Australia, it's usually involved John Daly throwing something. Or Tiger Woods diddling something. Not this time. This time, it involves a couple of caddies throwing punches next to the practice putting green at the Australian Open. "On Thursday a physical altercation took place between two caddies just prior to their groups taking to the golf course," tournament director Andrew Langford-Jones said in a statement. "PGA Tour of Australasia officials met the caddies and their respective players immediately after their round to clarify details of the altercation. "Having spoken with those involved, there is still a need to speak with a number of other individuals who may be able to provide further information on the incident." The clash was reportedly sparked by an altercation between the men at a city casino on Tuesday night and tensions boiled over in front of other players and spectators on Thursday. The local media is calling the incident "CaddyWhack." Given the exploding popularity of MMA fighting, and the financial struggles in Australian tournament golf in recent years, maybe there's a solution here! Put those caddies in a cage and let 'em fight it out between approach shots as groups reach the 18th green. What this list (and the full list, which you can view on PGATour.com) tells us is that the career money list is meaningless. Absolutely useless as an analytical tool. Stewart Cink and his six career wins is the 11th highest-earning golfer in PGA Tour history? What good does knowing that do? Jerry Kelly is in the Top 25? Good for Mr. Kelly, who has had a fine career and now gets to use a one-time exemption for being inside the Top 25 to keep his card for the 2013 season. But it doesn't tell us that Kelly is one of the 25 best golfers of all-time (an absurd notion), or even one of the 25 best of his era (highly debatable). It tells us that what it takes to make this list is to be a good (not great - just good, or, actually, just slightly above average) golfer on tour over an extended period of time, a period of time that is taking place in the current money environment. How useless is the all-time earnings list? Consider that, as I write this, Tim Herron is No. 45. Lumpy! If you adjust for inflation, does it matter? Not really. Golf tournament earnings have exploded far beyond the pace of inflation, for reasons mostly to do with first the arrival of television, and then the development of sports programming on television. And Tiger Woods (and to a lesser extent before Tiger, Arnold Palmer's arrival). So the PGA Tour all-time earnings list is fun so long as you don't take it seriously. Of course, by publishing this cover image and asking readers what they think of it, we are merely furthering EA Sports' marketing campaign for the game. Well played, EA Sports, well played. The 2012 - and final - PGA Tour Q-School wrapped up recently. And some of the veterans who failed to finish high enough on the money list also decided to skip going back to Q-School. What gives? Are they giving up on having full status? Are they too high-falutin' to go slumming in Q-School again? Not necessarily, and not necessarily. The PGA Tour has several other ways for veteran golfers to maintain fully exempt status, even if they fall below the cut-off point on the money list, even if they decline a trip to Q-School. Plan B is the Top 25 career money exemption, and Plan C is the Top 50 career money exemption. A golfer who is inside the Top 25 in PGA Tour career earnings can invoke an exemption to remain fully exemption. And likewise, a golfer inside the Top 50 in career earnings can do the same. Some golfers even use both, in back-to-back seasons. David Duval did that several years back, gaining two additional years of fully exempt status that he otherwise wouldn't have had. So, class, what do we think of Madcapz? I like 'em. They are "colorful caps with style and personality," their maker says, and who am I to argue? It's easier and easier to find silly, crazy, wacky, offbeat, wild colors and patterns - if that's your thing - in tops, bottoms, socks, even shoes. But not so much in golf caps. Unless the cap is sporting some kind of allegedly funny or daring graphic or slogan - in which case, the "funny" or "daring" is often just dumb or offensive. Madcapz are made for women. See more at madcapz.net. You probably heard the news: Keegan Bradley, playing in his first tournament since the USGA/R&A proposed rule change that will (if finalized) ban anchoring, was heckled during the World Golf Challenge. Specifically, he was taunted with cries of "cheater!" How deplorable. But not entirely unpredictable. In fact, in the aftermath of the anchoring announcement, the (possible) bad treatment by fans of current anchorers was one of the issues raised as a potential point of worry. But let's get this straight: Anchoring a belly putter or broomstick putter was specifically allowed by the USGA and R&A for all these past years; it remains permissable right now; and it will be 100-percent legal right up to until the very second it becomes illegal. Which, as of now, is expected to Jan. 1, 2016. A golfer anchoring a putter at 11:59 p.m. on Dec. 31, 2015, will not be breaking the rules, and will have every right to be anchoring. "This is a deplorable incident, and there is no place in our game for this kind of behavior. As we noted when announcing proposed Rule 14-1b, it has been and remains entirely within the Rules of Golf for players to anchor the club while making a stroke. There should not be a shred of criticism of such players or any qualification or doubt about their achievements, and we think that it is inappropriate even to suggest anything to the contrary. Rule changes address the future and not the past. Up until now and until such time as a Rule change were to be implemented, golfers using an anchored stroke will have been playing by the Rules of Golf. "We are sorry that Keegan had to experience this unfounded criticism from an obviously uneducated spectator. Instead, Keegan and other PGA Tour professionals should be commended for their maturity and grace in managing through a proposed change to the Rules of Golf." If you think it's cheating for a golfer to be anchoring right now, then you also must believe that Bobby Jones was a cheater because he played with concave-faced wedges before they were ruled non-conforming; you must believe Jack Nicklaus was a USGA cheater because for years he switched to the smaller "British ball" (USGA non-conforming) when playing the British Open; you must believe every golfer on all the professional tours who used square grooves were cheaters. And so on, going back through many rules changes over the decades that caused once conforming equipment or strokes to become non-conforming. The obligation of every golfer is to play under the rules that are in place at the time; not to play under past rules or future rules. Bradley, and all the anchorers, have done only this: abided by the rules in place. Old Tom Morris is not rolling over in his grave. But he might be turning his head and coughing. Because someone is on the hunt to find Old Tom's balls. His golf balls, that is. In 1891, Old Tom - probably the most important figure in golf history - was in Ireland for an exhibition of golfing. To warm-up, he practiced next to Lough Salt in County Donegal, hitting 20 balls into what is called Donegal Lake. And those ancient gutta percha golf balls, struck by Old Tom Morris, are, presumably, still down there in the silt at the bottom of the lake. At the end of the 19th century, four-times Open champion Morris was in the county to design the Rosapenna golf course. Local historians record an incident where the Scottish golfer stopped off at nearby Lough Salt to practise his swing. Now diver Gus O'Driscoll and four members of the Delta Specialist Diving Club are hoping they can find the rare golf balls. "There are literally thousands of balls at the bottom of Lough Salt because stopping off to hit golf balls there has been a tradition going back to Morris's time," he told the Irish Independent. "We have recovered some golf balls from the early 1900s but we haven't located Morris's golf balls as yet." If found, how much are Old Tom's balls worth? About €20,000 each, according to estimates.